Orval Overall (February 2, 1881 – July 14, 1947) was an American pitcher in Major League Baseball. He was a member of the Chicago Cubs dynasty of the early 1900s. Overall was born in Farmersville, California. He attended the University of California, Berkeley, where he was a member of Sigma Nu and captain of the football team. He was named an All-American in football. Overall started his professional baseball career in 1904. With the Pacific Coast League's Tacoma Tigers, he pitched 510.2 innings, going 32–25 with a 2.78 earned run average. He was drafted by the Cincinnati Reds in September. 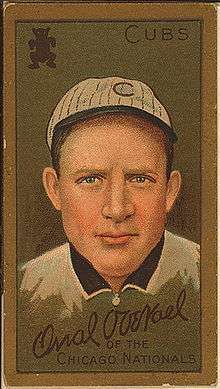 In 1905, his rookie season, he was the ace of the Reds pitching staff and won 18 games. He struggled early in 1906, though, and was traded to the Chicago Cubs. In 18 games for Chicago, Overall went 12–3 with a 1.88 ERA. The 1906 Cubs set a major league record for wins in a season and won the National League pennant. Overall pitched even better in 1907. He went 23–7 with eight shutouts and a 1.68 ERA. He also won a game in the 1907 World Series, and the Cubs won their first title. In 1908, Overall "slumped" to just 15 wins but also won twice in the 1908 World Series as Chicago repeated as champions. In that Series, Overall set a Cubs record for most strikeouts in a World Series game by a single pitcher (10), which has stood for 108 years. In the series-clinching game, he shut out the Detroit Tigers on three hits. In the first inning of that game, he became the first pitcher to strike out 4 hitters in one inning in a post season game (a feat not duplicated until 2013 by Aníbal Sánchez of the Detroit Tigers.) In 1909, he won 20 games and set a career-low in ERA (1.42). He also led the NL in strikeouts, with 205. Overall retired after the 1910 season. He made a brief comeback in 1913. He played seven years in the major leagues in total, compiling a record of 108–71 with a 2.23 lifetime ERA. He was the vice-president and manager of a bank after his baseball career ended. ↑ "Orval Overall Minor League Statistics & History". baseball-reference.com. Retrieved 2010-10-19. ↑ "Chicago Cubs at Cleveland Indians (Game 6)". 2016 World Series Broadcast. 1 November 2016. FOX. ↑ "Orval Overall's Obit". thedeadballera.com. Retrieved 2010-10-19.